I’ll get my background with character out of the way first: I would never consider myself I Dan Dare fan but I did read his adventures regularly when they relaunched the weekly Eagle comic in the UK in 1982. As with most childhood memories I can only remember scraps, nothing specific, but I recall enjoying the stories and thinking the Mekon was a perfectly realised villain. 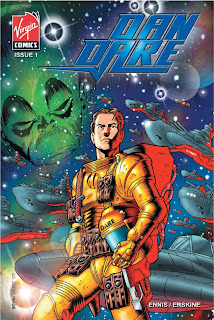 I haven’t read any Dan Dare in over twenty years, so in a sense I’m coming to the character fresh, and I was quite eager to read this new incarnation of one of the most famous British comic book heroes. On the surface, it’s an entertaining read and shows quite a bit of promise. When Garth Ennis is good, he’s very good, but when his obvious disdain for a character creeps out in his writing he’s infuriating, to put it mildly. Thankfully we get the former Ennis here – he obviously has great affection for the character, and it shows. I’ve never been overly impressed by Erskine’s work, it always comes across as a bit lifeless, and while there’s no change in that here, it’s functional enough that it doesn’t detract from the storytelling to any great degree. Overall, I would cautiously recommend this to older fans and newbies alike, although I doubt it’s destined for great success…. …… maybe it’s NME’s pitiful attempt at generating controversy over the last couple of days that’s got me on a train of thought that I wouldn’t normally take, but I’d like to think I would have picked up on this anyway: flick through this book and see if you can spot any non-white faces. I’m pretty sure there’s not a single one. Now, I’m not saying this was intentionally done but I do think this book is on potentially dangerous ground at the moment. Dare lives in a holographic environment that plants him in a quaint, English village in (what looks like) the 1950s, and during a conversation with the Prime Minister insinuates that the Britain of the future is a pale shadow of the Britain of the past. Fair enough, essentially Dare is a product of the 50s, but you would think they would make an attempt to update his ideology a bit and not make him look like an antiquated has-been with slightly suspect views. This is the “Pilot Of The Future” after all, and what kind of future are they suggesting in this book if there’s not a hint of ethnic origin in sight? I’m not attempting to be right-on with this review - I realise this, at its heart, is an old-fashioned space adventure - and I don't want it to sound like I'm trying to advocate tokenism either. However, I really think if a story of a totally white future Britain played out in a more popular medium (movies, TV) it would instantly get called out. Comics slip under the radar for the most part, which is generally a good thing, but sometimes we should ask questions where they need to be asked. Matt, I have great respect for your views on comics, but I think you're reading things into Dan Dare issue 1 that probably aren't there. As an experiment I picked up the comic that currently sits on the top of my pile of unread new issues (Detective Comics 837) and looked through it for non-white characters. All I found was an ethnic looking police woman in the background of page 20. That's it. I don't see anyone complaining that Detective Comics is misrepresenting the ethnic mix of New York. Let's not get too politically correct about this kind of thing. It's fiction. Fiction does not have a duty to represent society in a respectable way. If it did, we wouldn't have Bret Easton Ellis's American Psycho in print. As an aside, and on the subject of 'tokenism' I remember when Trident Comics signed me up to write a 10 part comic series. I sent a detailed proposal of the comic, including character biographies, and got a letter back from the editor asking me why all the characters were white, and couldn't I make some of them black? I wrote back and pointed out that I hadn't said they were white. My character backgrounds simply outlined the sort of people they were. As far as I was concerned the artist could decide what they looked like. Nothing in my character descriptions meant they had to be white, black, or purple. The point being, it's too easy to misread things into the writer's intentions. It's like all those English Lit teachers telling you what Shakespeare was thinking about when he wrote King Lear. No one knows what Shakespeare thought, full stop, and if he was a half decent writer (which obviously he was) then he's good enough to write things that do not reflect on his personality or beliefs. It's fiction. Fiction does not have a duty to do anything other than entertain. Quote: Fiction does not have a duty to do anything other than entertain. I don't agree with that, I think that's too much of a blanket generalisation. It's an artform - art can entertain but it also can provoke. And, yeah this issue provoked me. I can't tell from your comments if you've read the issue, so I don't know if your basing your comment on my review or the comic and my review. Anyway, I dug out Warren Ellis's Ministry Of Space, which I remember being described as Dan Dare-esque, just to see if I was off the mark, but no, Ellis's vision of a retro-future was not exclusively white. And I'm not trying to be politically correct, I'm just conscious of the society we live in and of how these things can be construed. Well, anything can provoke anyone (case in point at the moment naming a Teddy Bear Muhammad) – the question is whether or not the sensitivity expressed by the 'injured party' is reasonable and in proportion. Now, if Garth Ennis was writing racist material, you'd have a point, but the lack of black characters in a Dan Dare comic shouldn't provoke you, any more than the lack of black characters in the first Star Wars movie in 1977 should have done. You disagree with my statement that 'fiction does not have a duty to do anything other than entertain.' I'd be curious then what other duties you feel fiction has? Do you feel fiction has a responsibility to depict a moral viewpoint? To educate? Do you feel fiction isn't responsible without these qualities? I haven't read the comic yet, but I suspect I wouldn't have noticed the lack of non-white characters in it if you hadn't mentioned it. I suspect you're probably reacting more sensitively about this Dan Dare comic than most people would (non whites included). Some fiction is there to entertain, other fiction is there to provoke different reactions in the reader. I just don't think it's the duty of all fiction to do anything other than entertain. And yeah, you're right about Star Wars, but that was pointed out at the time and acted upon (go Lando!) and anyway, that was three decades ago. I think these comments by one of the main reviewers at Comic Book Resources probably played in the back of my mind when reading this book(and before you ask, I don't agree with what that guy's saying!) as well as all the Morrissey nonsense, but I'll say it again: if you had a TV show set in the future, broadcast now, with a whites-only cast, it would create a huge stink. And I think that's a fair point. I have to say I didn't notice any lack of cultural diversity in Dan Dare, but the fact that I went back to search through crowd scenes misses the point in my opinion. The appearance of a minority group needs to feel natural and not contrived, like wedging in an extra character just to please a vocal group. If the characterization is spot on then it shouldn't really matter about ethnic background, just telling a decent story. Remembering the Ultimates, when Nick Fury was changed from White to Black there was barely a flutter of uproar mainly because, in my opinion, the character was fully rounded and not cliched. I suppose the point I'm trying to make in a slightly rambling manner is that the story is what matters, and that I wouldn't like to see any half-assed attempt by writers to place a non-white character in a book purely to appease an audience that may not even be directly offended. I wouldn't want any minority group shoehorned into a story, that's not the point i'm trying (and maybe failing!) to make. Dan Dare seems to be a man stuck in the past, who doesn't accept change - hence he's living in some fantasy quaint old English village. That's the first thing that made me slightly suspicious about this new take on the character. The second is the apparent lack of ethnicity in future Britain. It's not a case of placing non-whites to appease an audience, they should just be there as part of our country's multi-cultural make up.